now in season: nantucket bay scallops! All scallops are not created equal, and Nantucket bay scallops’ sweet flavor and velvety texture has made these island natives a favorite among gourmands. 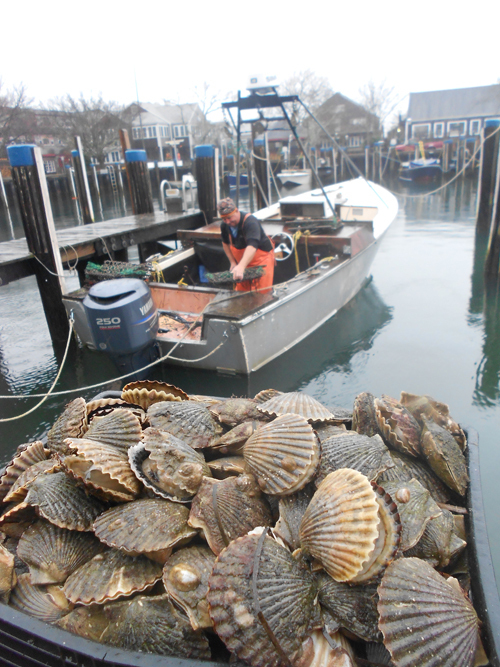 Nantucket scallop season kicked off last month and is in full swing through the end of March. 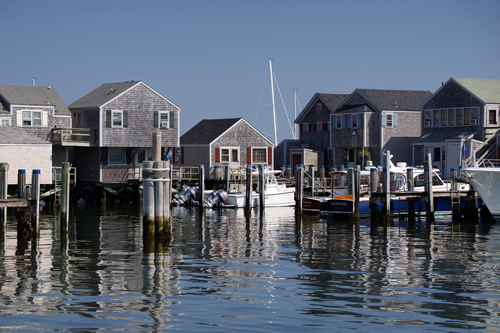 There has never been a better time to feast on the tiny delicacies as the icy waters of Nantucket Bay make them plumper and juicier. 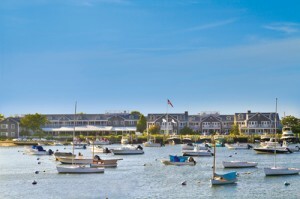 Head to Nantucket this winter to taste the native seafood straight from the source. When you aren’t getting your scallop fix, cozy up at the historic Jared Coffin House, warm up with a beer at Cisco Brewery, and browse the quaint shops on Main Street. Can’t make it to the island? Baked, sautéed, or seared, there are so many delicious ways to prepare scallops at home. Try this tasty recipe from Chef Fred Bisaillon of the White Elephant’s Brant Point Grill. Add butter to pan, and turn off heat. Move the scallops around the pan for another 15-20 seconds. They should be golden brown on one side, and butter should be brown but not burned. Spoon scallops and warmed oil/butter over the Arugula, and place Parma ham in the same pan for 20-30 seconds until warm, then place on top of scallops. Escape the humdrum of the holidays and leave behind the crowded stores, traffic, gift-wrapping, and tangled lights in exchange for a stress-free season at one of these 10 alternative spots. Whether it’s close by or halfway around the world, it’ll surely be unforgettable. 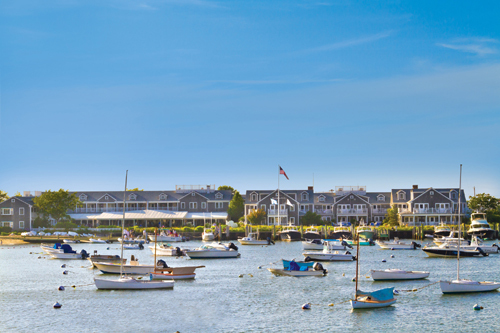 Why: Nantucket Island celebrates the season with Nantucket Noël, a month-long celebration that runs November 25–December 31. The highlight event is the Annual Christmas Stroll Weekend, December 2–4. Stores, shops, and restaurants open their doors for shoppers (almost everything on the island is on sale! ), carolers sing favorite holiday tunes, and Santa Claus arrives aboard a Coast Guard vessel. Steps from historic downtown, White Elephant is the perfect place to spend the weekend. For a longer stay, the Jared Coffin House is ideal. Open all season long and built in 1845, this historic hotel will have you feeling the spirit of the holidays. When: White Elephant rates start at $195 per night from December 1–5. 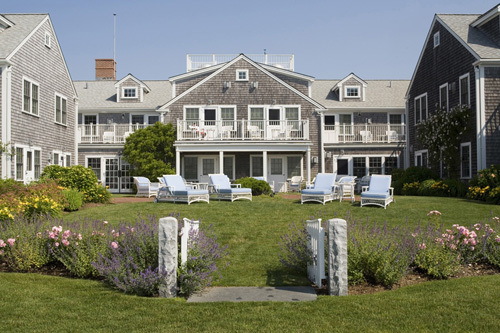 Jared Coffin House rates start at $155 per night during this special season. 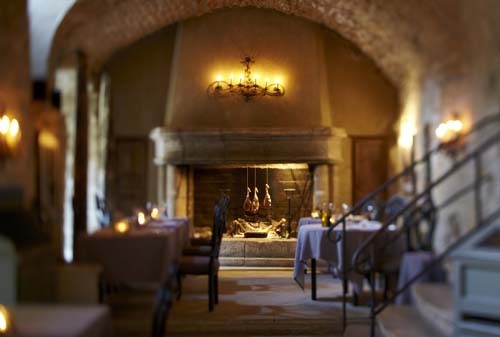 Why: Hidden in a tranquil town in France, Hotel Crillon le Brave is the perfect place to go for a peaceful escape. Festivities start on December 23 with a classical music concert in the local village church. On Christmas Eve, the hotel hosts an elaborate dinner that is sure to get guests into the Christmas spirit, who are also invited to celebrate the New Year with champagne in La Grange, the cozy bar, followed by a decadent dinner in the restaurant by a roaring log fire. When: Holiday rates start at $329 dollars per night from December 23–January 2. Why: Hop on the British Pullman and enjoy the caroling in Canterbury or Salisbury’s world famous cathedrals. Following the concerts, guests are welcome to roam freely through the festive cities. With each excursion, they can look forward to a delectable brunch served with a Bellini on the outward journey and a four-course meal with wine and champagne on the way home. To make the trip even more unforgettable, upon return to London, guests visiting Salisbury may choose to stay overnight at The Goring, a luxurious hotel adjacent to Buckingham Palace, where Kate Middleton spent her last night as a commoner. When: Rates begin at £350 ($550) per person and include brunch and a four-course dinner with champagne and wine. Dates for the Canterbury journey are December 6 and 13, 2011, and for the Salisbury journey, on December 15, 2011. Why: The new Le Pavillon des Lettres is housed in a classic Haussman townhouse in the 8th arrondissement. The hotel features 26 rooms – each devoted to a letter of the alphabet and an international writer corresponding to that letter. Shakespeare, Baudelaire and Rousseau are among the authors whose quotes are elegantly scrawled on the walls en Français. Settle down in the hotel’s library, next to the fireplace, and spend the holidays relaxing and reading while sipping a sumptuous cocktail from the honesty bar. When: Rates start at £250 ($345) per night. Why: Spend the advent of a new year in utmost relaxation unwinding in a private riad, a Moroccan style house decorated with luxurious hand-done tile work and mosaic-covered courtyard floors. Visit Royal Mansour’s own traditional-style hammam, while the children are entertained at the exciting Kids Club, before a luxurious meal with menus created by three Michelin-starred chef Yannick Alléno, or escape into the city of Marrakech for a bite while soaking in the unique rhythms of the centuries-old city. When: Holiday rates start at $2,228 for a one-bedroom riad from December 15 to January 7. Why: With sweeping mountain views, there is no shortage of adventure at Uma Paro. Bring the whole family during Uma Paro’s 10-day holiday program and attend lectures on Buddhism, go for hikes in the Himalayas, watch an archery contest, or participate in candlelit yoga sessions. There will also be a special mask performance, a Bhutanese film night, and an evening of traditional music and dance. Children 12 and under who are sharing a villa with their parents stay free. When: rates start at $330 until December 31, 2011. Why: For anyone wanting to get away for a week of relaxation and exploration before the holiday season kicks into high gear, the “Two Island Experience” package from Anantara is a perfect fit. The six-night island hopping adventure begins with a three-night stay at Anantara Lawana Resort & Spa on beautiful Koh Samui in the Gulf of Thailand, to be whisked away by speedboat to the more remote yet infamous island of the full moon parties, Koh Phangan, for an additional three-night stay at Rasananda Phangan Island Resort & Spa. When: rates start at $578 through December 20 and include accommodations, daily breakfast, speedboat transfer, and roundtrip airport transfers. Why: The holidays can be exhausting, so treat the family to a well deserved break at Uma Ubud. This exotic retreat overlooking a valley is the perfect place to unwind and explore with its lush forests, sweeping rice paddies, and COMO Shambhala Retreat spa. Nearby in the town of Ubud is COMO Shambhala Estate, a secluded, residential health retreat with a focus on wellness and relaxation. The Discover COMO Shambhala program allows guests to design their own wellness experiences at the retreat and is the perfect way to decompress during this stressful season. When: Holiday season rates start at $290 per night from December 20–January 6 at Uma Ubud, and the Discover COMO Shambhala program at COMO Shambhala Estate starts at $1,400 for three nights. Why: Experience the culture and beauty of India this fall with Shakti’s Kumaon village walking experience followed by a stay at 360° Leti, the boutique hotel set at 8,000 feet elevation. When: Season is from October 1 until April 30, 2012. A four-day, three-night Shakti Kumaon village experience is $1,307 per person, based on two or three adults, and includes accommodations, food and beverage, activities, English-speaking guide and porters, car at disposal, and roundtrip transfer between Kathgodam train station or Pantnagar airport and village houses, and taxes. Rates for a three-night, four-day package at 360˚ Leti start at $1,916 per adult, based on two traveling on a twin/double share basis. Rates include accommodation in a private cottage, all food and beverage, activities, English-speaking guide and porters, car at disposal, roundtrip transfer between Shakti Kumaon village experience and Shakti 360˚ Leti, and all taxes. Why: For anyone seeking an unforgettable holiday adventure with the whole family, Anantara Golden Triangle Resort & Spa’s Mahout Discovery package is just the ticket! Learn how to feed, bathe, and ride these gentle giants through the forest during a 3-day mahout training course. Perched on a lush hillside near the borders of Burma and Laos, the resort, so rich in culture, is a blissful escape for adults and children alike. When: rates start at $342 per night based on double occupancy through December 31.